Back to the Future fanatics should not miss the opportunity to pre-order this wonderful collectible figure! Pre-ordering at Ani-Com will include a 1/6th scale guitar as bonus accessory. It would be cool if one of the hands was semi transparent. Still awesome! amazed that they could get the likeness so perfect as michel j fox given how the actors are almost impossible to get to okay their use for figures for any back to the future line. including michel j fox himself. If there will be a scaled Delorean released along with Marty McFly (as hinted in the pic) then I will be all over it… if its just Marty, then I don’t know if I’ll take the plunge. 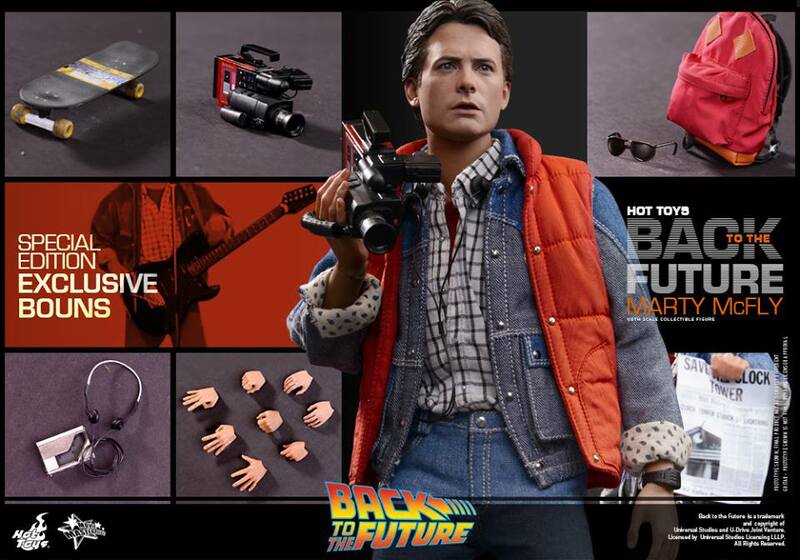 Perhaps if they release a BTTF2 Marty with hoverboard and self-drying jacket I’ll be more keen to make the purchase! Massive kudos to Hot Toys though for bringing a classic licence to their lines… I am so fed up with their constant Joker and Iron Man releases that I was starting to wonder if they had seen any other films.